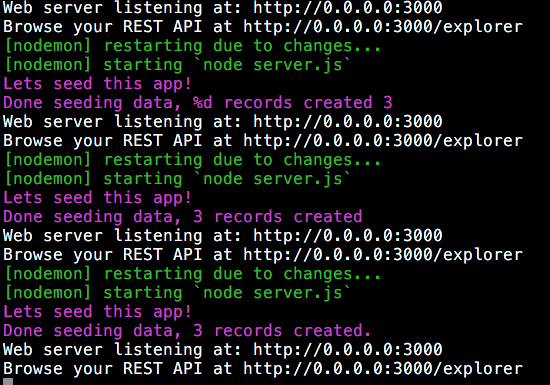 Automatically restarting a node.js application when a file changes speeds up development but means lots of restarts. This article shows how to re-seed data into a test application when using StrongLoop. Please Read! A few hours after posting this, a member of the StrongLoop team pointed out an alternative that did exactly what I wanted to accomplish in about one second of typing. I still think the core of this blog entry makes sense as is so I’m not editing it, but see the note at the bottom! This is just a quick post as a followup to something I mentioned in my post the other day on building a blog with Strongloop. I mentioned that while working on my application, I kept losing my temporary data as I was using the “In Memory” datasource that is the default persistence method for data. That’s not a bug—in memory means exactly that—in memory—and as I restarted the app (using nodemon), I had to re-enter fake data to test. While it takes all of three minutes to connect your app to Mongo, if you don’t have Mongo (or MySQL, or a db in general), it would be nice to be able to stick with the simple RAM based system while prototyping. I’m still new to Strongloop and Loopback in general, but this makes sense. My needs were far simpler, so here is a script I came up with (and again, Jordan helped me make it better) that just writes to a model in the in memory datasource. Pretty simple, and it works nicely. Still—probably—a bad idea in production. But as I said, this would be incredibly useful when prototyping!